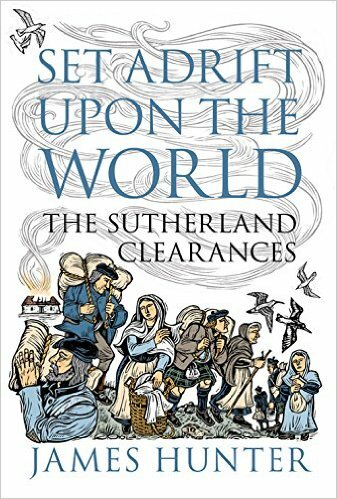 In ‘Set Adrift Upon the World’ James Hunter masterly weaves together a fascinating account of the Sutherland Clearances. One that takes you from the Strath of Kildonan and other parts of Sutherland to battles in New Orleans via South Africa and onto the foundation of what is now the Canadian city of Winnipeg. Along the way you are introduced to characters from the early 1800s that have a familiarity about them as their names remain in use today throughout the Highlands & Islands of Scotland. Heart wrenching accounts are given of the barbarity of evictions that left people homeless and often resulted in the death of the young or infirm shortly on the back thereof. Journeys by foot across frozen Canada conjure up images like those from the Oscar winning film ‘The Revenant’. On a lighter note the intricacies of malt whisky making are explained and we learn what Alison Watt’s favourite painting is in the collection of the National Galleries of Scotland. The clearances were at the behest of the Marquis and Marchioness of Stafford (later to become the Duke and Duchess of Sutherland) to make way for large scale sheep farming. Those removed from the land would have the option of much smaller crofts on the fringes of the Sutherland Estate that would be unsustainable on their own without other income streams. Much indeed as crofting has become today. Many of those evicted instead moved to Caithness or further afield to Canada for the prospect of larger holdings on which to make a living. The henchmen in the tale are James Loch, Commissioner to the Marquis of Stafford, and Patrick Sellar, Factor of the Sutherland Estate. The chapter on the trial of Patrick Sellar in the High Court on culpable homicide charges is an infuriating read for anyone concerned with the rule of law. Indeed that is a theme throughout the book where wealth and status invariably lead to injustice for others. 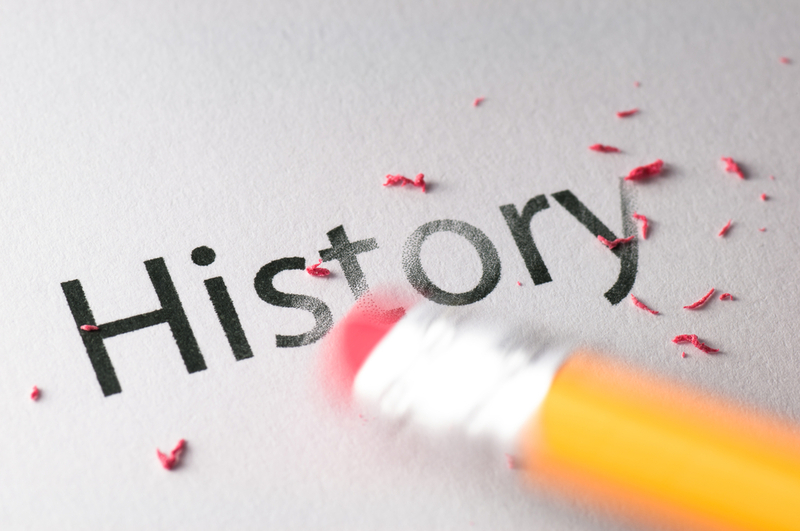 The book often feels more like a fictional novel rather than a factual historical account. That is the beauty of James Hunter’s approach to history and one he himself refers to as storytelling. This makes it a real page turner with you eager to know what happens next even though you know what the ending must be. It was impossible for me to read this book without unfortunately seeing parallels to ‘The Common Clearances’ of today. That is the removal from office of Common Grazings Committees by the Crofting Commission. A body whose remit is supposedly to regulate not decimate crofting. This is currently happening with unusual regularity, in haste and on what appears to be completely unreasonable and unnecessary grounds. The Crofting Commission are today’s Marquis and Marchioness of Inverness and their henchmen are easily identifiable. Kangaroo courts, ignorance of the law, conflicts of interest, self-interest, corruption, nepotism, historical revisionism, intimidation and bullying have all been referred to as tactics used by the Crofting Commission as part of ‘The Common Clearances’. About the only difference with the Sutherland Clearances so far is the absence of fire. To think these comparisons are being made 200 years after the Sutherland Clearances is hard to fathom. Equally hard to believe is the fact that the Scottish Government of today has so far not intervened in what the Scottish Crofting Federation has referred to as a “calamity”. As James Hunter points out, Beriah Botfield, a Tory MP, commented in 1830, that no “pursuit of prospective advantage” made it legitimate “to transgress the laws of humanity”. N.B. This book review was written for and first appeared in Scottish Legal News and Irish Legal News. This entry was posted in Book Review, Common Grazings, Crofting Commission and tagged Alison Watt, Beriah Botfield, bullying, Caithness, calamity, Canada, Commissioner to the Marquis of Stafford, Common Clearances, Common Grazings Committee, corruption, Crofting Commission, crofts, Duke and Duchess of Sutherland, evictions, Factor of the Sutherland Estate, henchmen, Highlands and Islands, historical revisionism, injustice, intimidation, James Hunter, James Loch, Jim Hunter, Kangaroo court, malt whisky, Marquis and Marchioness of Stafford, National Galleries of Scotland, New Orleans, Patrick Sellar, Scotland, Scottish Crofting Federation, Scottish Government, Set Adrift Upon the World, South Africa, storytelling, Strath of Kildonan, Sutherland, Sutherland Clearances, Sutherland Estate, The Revenant, Winnipeg on August 2, 2016 by Brian Inkster. James Hacker: You said yourself how important these select committees are. I cannot be seen to mislead them. Sir Humphrey Appleby: You will not be SEEN to mislead them. 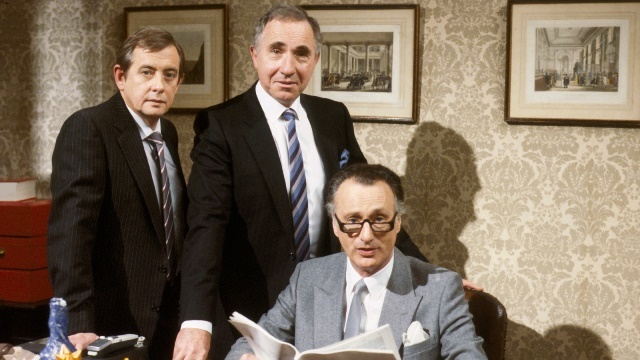 How the Crofting Commission played out their sudden and surprise U-turn on the question of ‘The Common Clearances‘ would not have been out of place in an episode of Yes Minister. Sir Humphrey Appleby would have delighted in the obfuscation and manipulation displayed by the Crofting Commission in Holyrood on Wednesday night. However, like Sir Humphrey, the Crofting Commission is not immune to making miscalculations or outright blunders. It was the first meeting, since the latest Scottish Government was formed, of the Cross Party Group on Crofting within the Scottish Parliament. It was the first time, since allegations of abuse of power within the Crofting Commission over ‘The Common Clearances‘ were made, that the Crofting Commission would meet eye to eye with politicians and other crofting stakeholders in a public forum. In the preceding week or two damning revelations had been made of historical revisionism and flouting the will of Parliament on the part of the Crofting Commission. This was on top of votes of no confidence against them, the Convener of the Crofting Commission attending meetings despite a clear conflict of interest, a Crofting Commissioner resigning and calls for the Scottish Government to investigate the whole matter. It looked like the Commission would be in for a very rough time at the Cross Party Group meeting. They knew that and had to do something quick and decisive to limit the damage being caused to them and that could be wrought on them at that meeting. Nothing like a massive U-turn, with an attempt to dress it up in other ways, to achieve that. So Crofting Commissioner, Murdo Maclennan (the Convener, Colin Kennedy, was conspicuous by his absence), announced to the Cross Party Group that he “thought we have a conclusion” on Mangersta and there was “no grazing constable in place at the moment“. there is no constable at present, the case is over and the people of Mangersta will be advised. So case closed and no further discussion on that then. Please move along ladies and gentlemen. When the removal of the Upper Coll common grazings committee from office was mentioned that, of course, could not be discussed as it was subject to on going proceedings in the Scottish Land Court. The third committee that the Crofting Commission have evicted from office was not mentioned at all, other than briefly by me when Commissioner Murdo Maclennan insisted that I declare my interests. I think that perhaps backfired on him as the Commission would rather pretend that episode never happened as there has, to date, been no publicity surrounding it. So one case conveniently closed, one sub judice and one we can simply forget about. Thus nothing really to talk about. The extra gloss on this being that new guidelines were being produced by the Commission and all would be well when these were issued and followed. My criticism of this approach is already well known. You have to get the law right first before you write guidelines about how to follow that law. The Commission’s viewpoint is that their interpretation of the law will follow “in due course”. Perhaps this is because their latest massive U-turn means they actually now accept the law to be as I have been setting it out to be on this blog for some time! The U-turn is great news for the shareholders in the Mangersta Common Grazings and the former members of their grazings committee. It is a vindication of the position correctly maintained by them throughout. It leaves the Crofting Commission with egg on their face however they try to dress it up. The Emperor’s New Clothes remains a theme, in so far as the Commission is concerned, post the Cross Party Group meeting. In my next blog post I will reveal how the Crofting Commission not only ignore the law but lawyers who write to them concerning it. In a subsequent blog post I will explore the significance of the latest U-turn by the Crofting Commission and the possible repercussions thereof. This entry was posted in Common Grazings, Crofting Commission and tagged abuse of power, Catriona Maclean, Chief Executive of the Crofting Commission, Colin Kennedy, Common Clearances, Common Grazings Regulations Guidance, conflict of interest, Convener, Convener of Crofting Commission, Crofting Commission, Crofting Commissioner, crofting stakeholders, Cross-Party Group on Crofting, Grazings Constable, Guidelines, historical revisionism, Holyrood, investigations, Mangersta Common Grazings, Mangersta Common Grazings Committee, menacing presence, MSPs, Murdo Maclennan, no confidence, resignation, Scottish Government, Scottish Parliament, Sir Humphrey Appleby, sub judice, the emperor's new clothes, U-turn, Upper Coll Common Grazings, Upper Coll Common Grazings Committee, vote of no confidence, will of Parliament, Yes Crofting Minister, Yes Minister on July 2, 2016 by Brian Inkster. On this blog on 25 April 2016 I called for the Scottish Government to review the Crofting Commission’s actions in connection with ‘The Common Clearances‘ due to an alleged abuse of power within Great Glen House. The Scottish Crofting Federation and others have backed that call. Yesterday the Scottish Crofting Federation reiterated that call on the back of apparent historical revisionism on the part of the Crofting Commission. Statements by the Convener of the Crofting Commission, Colin Kennedy, previously published on their website have been deleted and a different version of events presented by their Chief Executive, Catriona Maclean. The uncovering of this underhand behaviour on the part of the Crofting Commission has resulted in mounting pressure for the Scottish Government to now actually do something about it. Uisdean Robertson, Councillor and Chair of the Joint Crofting Committee of Comhairle nan Eilean Siar (Western Isles Council), has been quoted as saying on Radio nan Gàidheal that the Council have no confidence in the members of the Crofting Commission and their Chief Executive. He has said that Crofting Commissioners and the Chief Executive all need to think about their positions in light of what has gone on. 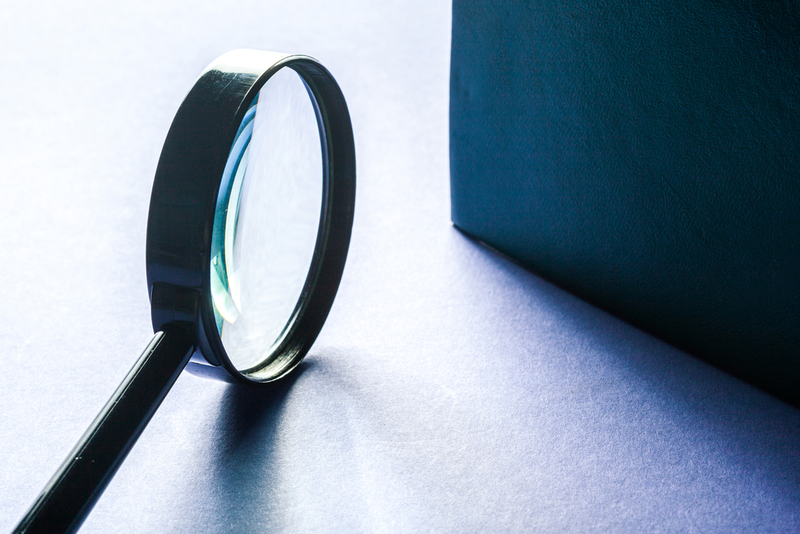 The immediate question is whether the Scottish Government is prepared to back their quango’s interpretation of the law and its heavy-handed approach to enforcement. In the short term, a rapid inquiry into why the Crofting Commission has got itself into this mess and how it can be helped out of it may seem a relatively attractive option. It has been asked on Twitter who would carry out such an inquiry. It must be someone with investigative experience (with a team at their disposal to assist them) and who is truly independent with no association whatsoever with Commissioners, the Convener or the Chief Executive. The Commission is confident they are applying the law correctly but the only place this can be clarified is in the Scottish Land Court. However, the Crofting Commission have yet to set out any legal argument with reference to statute or case law to show that they are applying the law correctly. I am strongly of the view that they are not. My detailed legal reasoning to them on this has gone unchallenged other than for them to say that once they make a decision that is final and cannot be changed by them! If the Crofting Commission are so confident that they are applying the law correctly they should have nothing to fear by making a reference to the Scottish Land Court to confirm that. As they clearly do not wish to actually be found out to be in the wrong (the same is true of the decrofting debacle that resulted in unnecessary ‘remedial’ legislation at huge expense to the taxpayer when a Section 53 reference could easily have resolved the issue) the Scottish Government should advance that reference or insist that the Crofting Commission do so. 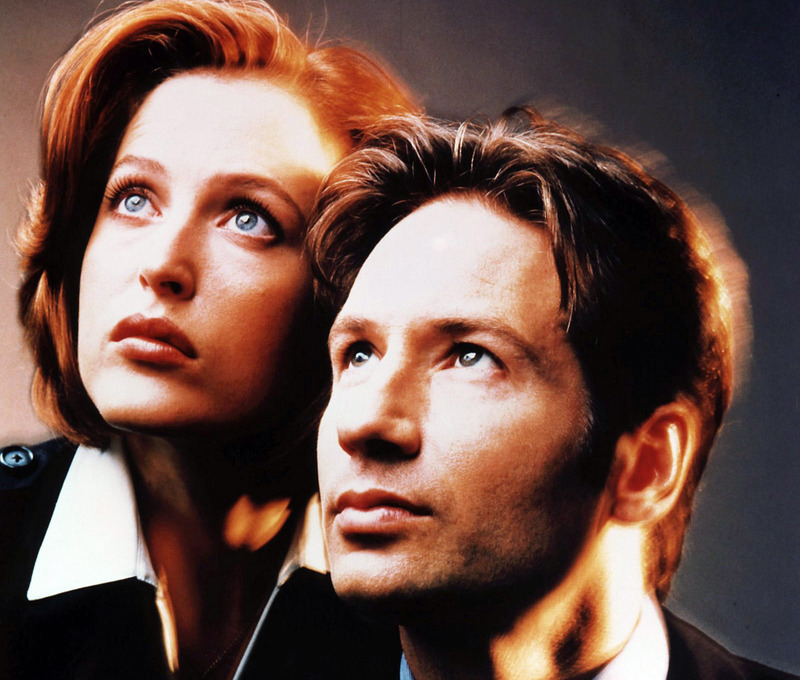 The truth is out there and it is in the Scottish Government’s hands to find it. This entry was posted in Common Grazings, Crofting Commission and tagged abuse of power, Brian Wilson, Chief Executive, Chief Executive of the Crofting Commission, Colin Kennedy, Comhairle nan Eilean Siar, Common Clearances, Common Grazings, Convener, Convener of Crofting Commission, Crofters (Scotland) Act 1993, Crofting Commission, decrofting debacle, Great Glen House, historical revisionism, no confidence, Radio nan Gàidheal, Scottish Crofting Federation, Scottish Government, Scottish Land Court, Section 53 reference, The Scotsman, the truth is out there, Twitter, Uisdean Robertson, Western Isles, Western Isles Council on June 18, 2016 by Brian Inkster. Following the revelations yesterday that the Crofting Commission has been deleting its online history and thus, in effect, using historical revisionism to paint a different picture of ‘The Common Clearances‘ a call has been made, once more, by the Scottish Crofting Federation for an independent investigation into their actings. “’The Crofting Commission are lying to us’ would perhaps be too strong an accusation” the chair of the SCF, Fiona Mandeville, said, “but it is clear that they are spinning distortions. Saying one thing and then trying to hide the evidence that they have indeed said something else in the past is duplicitous to say the least. “This has gone far enough” Ms Mandeville continued. “It seems we can no longer hope that the Commission will come clean and will behave honourably. We have encouraged the Commission all along to allay the fears of crofters and to try to rebuild confidence. With the recent public statements they at last appeared to be moving around to the right direction, but with this ‘cover-up’ exposed they have now drastically reduced confidence further. We reiterate our petition that the Scottish Ministers intervene and ensure that an impartial examination of the Commission’s recent conduct is carried out by a competent external body. The reference to the full audit is, of course, a reference to the Crofting Commission’s insistence that Upper Coll Common Grazings Committee should produce full audited accounts where this was clearly unreasonable and unnecessary for a Grazings Committee to be expected to do and contrary to what the Crofting Commission had previously stated was expected of Grazings Committees. We will return to that point in greater detail on this blog in future posts as it is worthy of detailed examination to demonstrate clearly how unreasonable the Crofting Commission were being. However, as the Scottish Crofting Federation say, it would certainly be appropriate for a public body such as the Crofting Commission to have a full audit carried out on it in these circumstances. Given the continuing and mounting evidence surrounding potential abuse of power within the Crofting Commission, the Scottish Government should, indeed, instigate such an audit as a matter of priority and without further delay. This entry was posted in Common Grazings, Crofting Commission and tagged audit, audited accounts, Chair of Scottish Crofting Federation, Common Clearances, Common Grazings, crofters, Crofting Commission, Fiona Mandeville, Grazings Committee, historical revisionism, Scottish Crofting Federation, Scottish Government, Scottish Ministers, Upper Coll Common Grazings, Upper Coll Common Grazings Committee on June 17, 2016 by Brian Inkster. No… the Crofting Commission never said that! 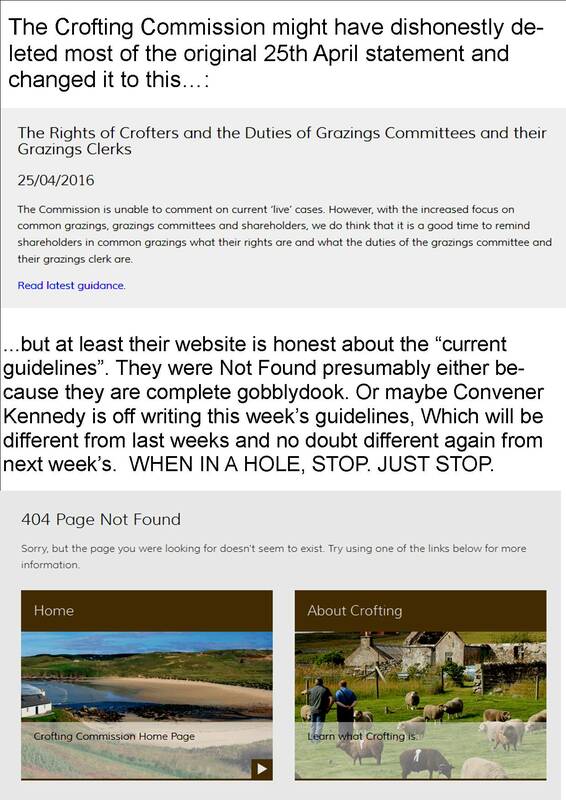 The ‘Crabbit Crofter‘ brought to our attention today the fact that the Crofting Commission have been deleting/changing their website in so far as guidelines concerning ‘common grazings the rights of crofters and the duties of grazings committees and their grazings clerks’ are concerned. 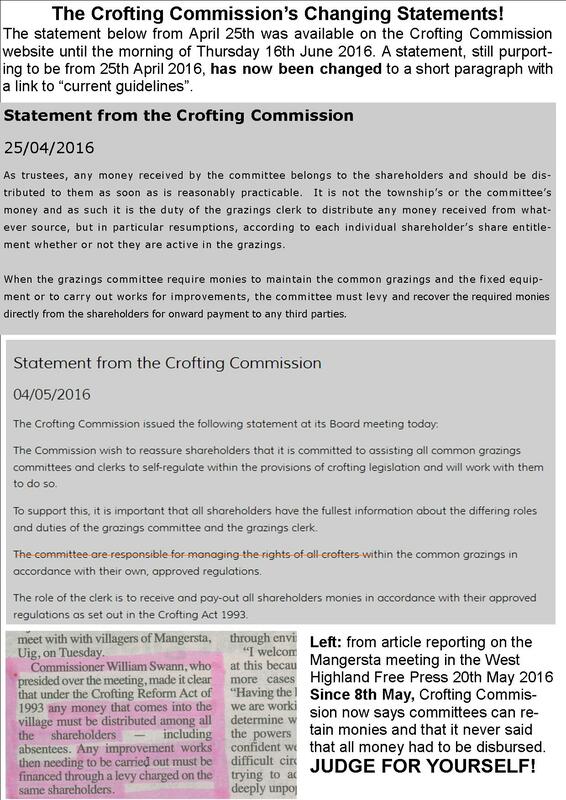 It seems to me like a very good time to remind shareholders in Common Grazings what their rights are and what the duties of the Grazings committee and their Grazings clerk are. This came almost immediately on the back of us publishing a post on this blog concerning alleged abuse of power within the Crofting Commission linked to what has become known as ‘The Common Clearances‘. It is extraordinary that a public body in Scotland in this day and age is resorting to historical revisionism and we shall return in a subsequent post to the significance of this in light of what the Crofting Commission is now claiming their current and past position on ‘The Common Clearances‘ to be. Update – Read what the Crofting Commission tried to hide: The deleted Crofting Commission post and why: Oh yes you did! This entry was posted in Common Grazings, Crofting Commission and tagged abuse of power, Common Clearances, Common Grazings, Common Grazings Committee, Convener, Convener of Crofting Commission, Crabbit Crofter, crofters, Crofting Commission, Grazings Clerk, historical revisionism, shareholders on June 16, 2016 by Brian Inkster.